l would like to thank you for the support you rendered in 2017. Now that we are going into the rainy season we have a different plan to combat poaching. Because of bad roads during this time we started “flying anti poaching camps,” where scouts are camping for twenty (20) days before we put another team in the field. We managed to confiscate two guns, impala meat, fifteen (15) snares and two pairs of ivory tusks. A poacher was arrested and a gun and impala meat was recovered in the Game Management Area near the Mwangazi River. The two pairs of ivory tusks was dropped by poachers after an encounter with officers on the Mutants Plain. More ivory and a firearm were recovered by another team of officers in Kazungula. I would like to report that we had twenty (20) days operation in the month of January, 2018. In four different operations, we arrested three poachers, and we recovered two guns, a pair of ivory tusks and six pieces of ivory. One poacher we arrested was a forty-five (45) year old man from Musoro village nicknamed “Commander.” He had a homemade muzzle loading gun which had no serial number. He was caught in Luangwa National Parks as he was hunting elephants. When he was caught he had not killed any, but he confirmed he was hunting elephants. The other two poachers where caught with six pieces of ivory. They were on Mwanya Lundazi Road transporting 130.6 kilograms of ivory to be sold. They were from Malawi. They are now in prison cells waiting to appear in court. Another gun was recovered after it was dropped by poachers when they saw wildlife officers from a distance. The officers tried to follow, but the distance between them was too great and they were unable to catch them. 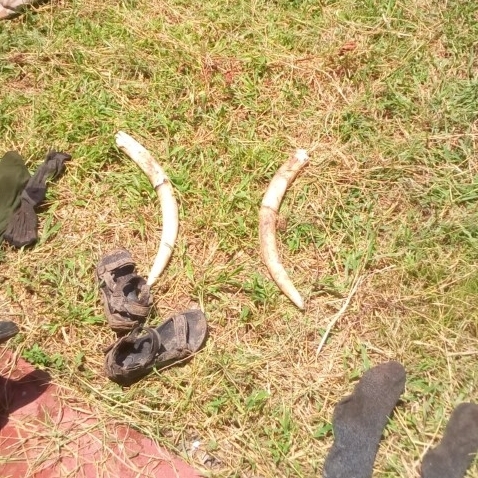 The pair of ivory tusks were recovered in the afternoon of a sunny day from a dead elephant near the from Tena Tena Bush Camp. Newer PostRewards for wildlife whistleblowers!